Dear The Lucky One....I know you got horrible reviews but I thought you were amazing and I just might see you again...I apparently still have a thing for cheesy movies and bad acting....and Zac Efron. Dear disgusting man at the gym who doesn't wipe down the machines.....no one thinks that's cute. Dear toes....You like to run, I swear you do. And I've been putting you in nice shoes lately so, please......start liking a pair. Dear Suede Fringy Top....You spoke to me from the racks of the Forever 21, now I just need a place to wear you. Dear summer, I plan on having a full-fledged love affair with you....get ready. Dear Sara (in Le Petit Village) you are the winner of the Shabby Apple Giveaway!! I will email you soon! Dear Tomorrow's Workout.....I am REALLY excited for you! Dear blog friends, you are my sunshine! I've been contemplating seeing The Lucky one and you have totally just sold it to me! I may see it over the weekend. Loved reading your letters, hope your weekend is amazing! i'm all for cheesy movies even with bad acting. I need to see it! and I am so ready for summer! have a great weekend! ahhhh i wanna see The Lucky One! Zefron...mmm mmm mmm deeeelish! i think you must show us this fringe top!!!! BAHAHA! I hate the guys at my work who don't clean the machines after they're done with them. Soo gross! I want it to be warm and summery, but it also scares me because the sooner summer gets here, the sooner my job gets a lot busier!! I, too, LOVED The Lucky One - maybe it was Zac Efron - or maybe cuz it was so sweet and sappy. I would love to see it again. I'm seeing The Lucky One tomorrow, I hope it's good! YOU are my SUNSHINE! ANDDDDDDDDD this summer is already destined to be great because I get to see you! Is this REAL life!? Love you! damn you Sara! but not really, 'cause i don't think i remembered to enter myself... argh. have a great weekend, ash!! NEED to see the lucky one asap. Was supposed to go last wknd but couldn't so maybe this wknd?! I saw the Lucky One on Monday. I thought it was delightful, as was the book. Zac Efron looks good! I like this letter! I haven't seen "The Lucky One" yet. I don't know if I will before it comes out on DVD. I spent my movie money on "The Cabin In The Woods" and it was NOT disappointing! So good! Really? I am also into sappy movies.. the more the better .. have yet to see this movie! On my to do list! I kind of what to see the Lucky One only because of Zac Efron. He is so dreamy. I have been dying to see The Lucky One!!! I'm so happy to hear that you liked it! I am so excited to see the Lucky One! And, when did Zac Effron go from a cute teenager to Hello Hottie! have a great weekend, ash!! Your toesies will love you soon!! oh no, your toes aren't happy?!? are your shoes too snug? When I get a new pair and am running long distance I get small blisters on my big toe and the very top. thankfully I haven't gotten that in my asics. The ones I am in are two seasons ago now and I am hoping I can keep ordering them online because I loveeeeeeeee them! AND I want to see the lucky one, but I will probably rent it since jonathan will think its dumb! so glad you linked up today! love you and miss you! and all that ;) LOVE BURST! I heard the same thing about The Lucky One -- I am obsessed with Zefron so I need to see it, only to see his abs. Ow ow! I also would like to see the fringe top -- sounds adorable!! 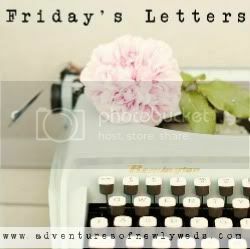 Found your blog through your Friday's letters link. So gross about the sweaty man at the gym who doesn't wipe the machines. I always wipe before and after because I don't trust anyone. And I ALWAYS seem to attract the nastiest people to the machines right next to me, even when the gym is EMPTY. Ugh, gross. Excited to be your newest follower and looking forward to your letters next Friday!